This stylish and durable Eurosmart Cosmopolitan kitchen tap is perfectly designed with three hoses for anyone using an open water heater rather than a central warm water supply. As a single-lever mixer it’s easy to operate and has a cutting edge GROHE SilkMove ceramic cartridge so you can control water temperature and flow with smooth precision. With its mat GROHE SuperSteel finish, it becomes an instant design highlight and is extra hygienic thanks to its smooth surface. 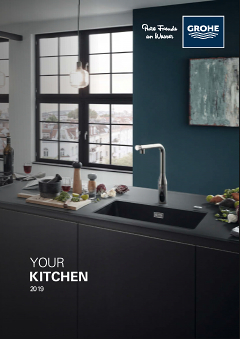 The Eurosmart Cosmopolitan kitchen tap – blending beautiful design and trusted quality for your kitchen convenience.